Chalet Maldeghem is a stylish Swiss chalet in Klosters close to Davos. Klosters is a picturesque Swiss village with an enviable snow record and home to the most exciting and thrilling off-piste skiing in Europe. This luxury chalet is perfectly positioned with easy access to the ski areas and Klosters' great restaurants are just a few minutes stroll. The views from the property is sensational, with direct views of the exlusive resort of Klosters home to powder snow and an exclusive haven for VIPs and royals. Chalet Maldeghem is the perfect chalet for the elegant alpine lifestyle vacation! Recently redecorated and renovated to the highest standards, the interiors of this beautiful chalet offers top level pampering with its luxurious fittings and furnishings. The drawing room includes a sitting area, a chill-out area with a flat-screen TV and an open fireplace and a dining area. The living area leads through to a well equipped kitchen. Also on this floor is a large south-facing balcony, on which one can enjoy the beautiful views of Klosters. This private vacation rental is set out in three levels and can accomodate up to 10 people. There are 4 double bedrooms, 2 single bedrooms and one bunk bedroom all with fine linen. All bathrooms include fabulous bath products by Ortiga Sicilia. On the main floor is a double bedroom with shower, two single bedrooms, a bathroom and a second separate bathroom. The upper level has a self-contained large room with king size bed and sitting area, with satellite TV and a large bathroom, plus a single bedroom with en-suite bathroom. The lower level has a separate master bedroom newly decorated double room with king size bed, satellite TV and direct access to the garden, with a large bathroom and separate sauna/steam shower. On the same level is also a small gym and separate staff flat. Chalet Maldeghem offers a great vacation in a lifetime. Around the property are exceptional ski areas for professional athletes and beginners alike. Michelen restaurants are just a few minutes away and access to Davos' shops, spas, several art galleries, 2 museums and a casino is only a 10 minute drive. There are miles of cross country ski trails, skating, sledging (with 7 long sledge runs), horse riding, horse drawn sleigh rides, winter polo, snow shoe trekking, snowboarding (with access to a half pipe), paragliding, swimming, bowling, tennis and squash. For children, there is the very popular Mardens Club Junior Training in March and April. 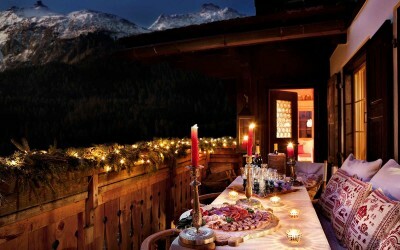 A unique Retreat with excellent service in one of the most famous ski destinations close to Davos in Switzerland. Contact us for price information. Prices start from 15000 Euro/week.